The Bohemian Massif (called B.M. in the following) has been protruding from the Tethys Sea as an island since the Upper Paleozoic. Only during the Upper Cretaceous, the sea transgressed from the N, so that large areas of Bohemia were covered (the S parts remained dry). Due to the small elevation of the landscape, the hills that remained from the variscian orogen were eroded, forming a peneplain, whose relics are still visible at the top of the plateau. When the Alps collided with the B.M., it rose several hundred meters, producing vast amounts of erosional debris, which was sedimented in the Molasse Sea (S of the B.M.). When the sediments had filled up the basin (from W to E), river Danube drained the resulting plain. Different from today, it reached the sea N of Vienna (which is 1900km away from the sea today), without any need to use the Gap of Vienna. In the Miocene, the B.M. rose further, shifting its S rim to the S. This caused tremendous erosion and the slopes steepened. So far, the Danube could compensate the rise by erosion: It cut a small "canyon" through the B.M., flowing through today's Ysper Valley passing Laimbach and Poeggstall until it met the recent Danube Valley at Spitz (the Ysper Valley may have looked like today's Wachau, with steep slopes and water falls - the Ysper gorge remained, the west and north slopes of the Ostrong and Jauerling mountains are remarkably steep). Later, the course to Spitz dried up, forcing the Danube to flow from Poeggstall through the Weiten Valley to Melk. Finally, it also left the Ysper Valley and found its recent course via Ybbs, Poechlarn, Melk, Spitz (Wachau) and Krems. In case the B.M. would rise further, the reaches between Passau and Linz, the Strudengau and the Wachau would look like the Ysper Valley today (dry), whereas the Danube would flow past Schaerding, Eferding, Traun, City of Haag, Amstetten, Mank und St.Poelten to Tulln! See animation or online map! As a valley glacier grows thicker and thicker, it may flow over the lowest gap of the ranges that contain it. Consequently, the gap is grinded down like a valley, resulting in a U-shaped gap, which is called transfluency gap. There are two further interesting impacts on the morphology: Firstly, the erosional force of the main glacier decreases due to the loss of ice flowing to the valley beyond the gap. This means that the valley cannot be ground down as intensely as before the fork, so that the bottom of the valley rises towards the exit of the valley (!). When the glacier retreats, a lake forms in the basin (similar to the foreland lakes at the end of the valleys), which flows off into a torrent that cuts into the lake's dam (so lowering the lake level) until the lake dries up. However, the resulting gorge is more narrow than the glacial U-shaped valley bottom, which causes erosional terraces remaining on both sides of the valley. Exemplary morphologies are represented by the tr. gap of Seefeld (causing the terraces at Innsbruck and the Sill gorge), the Salzach gorges between Taxenbach and Schwarzach (in this case, the Salzach glacier forked (diffluency): one half via Saalfelden to the Saalach valley, the other to Bischofshofen; the Kitzloch, Gastein and Liechtenstein gorges are another result). Alike, the Etsch glacier (flowing from Meran to Bozen) transfluenced the Gampen Gap and flowed across the plateau N of Bozen, which reduced its erosional force greatly. This is documented by the terraces that can be traced from Voellan (S of Lana) via Tisens and Prissian to the reaches S of Bozen. Moreover, the Piller pass (S of Imst), the Mount Isel near Lienz (the Moell glacier transfluenced to the Drau glacier; attention: the adjacent Stronach Gap is caused by the Drau-Moell-Fault! ), possibly the Brenner pass (glaciers might have flown from Sterzing to Innsbruck?! compare satellite image) and the Gailberg Saddle represent typical transfluency gaps. The Gailberg Saddle leads us to the second consequence of transfluency: the transfluent branch often confluences with another glacier, which might have been occupying the adjacent valley before ("confluency"), which increases the erosional force of the latter. As a result, the valley is steepened longitudinally. When the glacier retreats again, the river at the bottom of the valley cuts deeply into the rock (due to its high erosional force), whereas the debris accumulates at the flatter reaches of the valley (flat basin). As the Gailberg Saddle is concerned, the Lesach Valley represents a typical gorge above the confluency whereas the following Upper Gail Valley is a flat sediment plain (see sketch). Similarly, at the confluency of the Salzach and Lammer river (both having spectacular gorges) the plain of Golling and Kuchl extends. As regards Innsbruck, this phenomenon is visible too, so that the morphology there gets even more complicated: the transfluency of Seefeld had made the valley bottom rise, whereas the joining Wipp Valley and Ziller glaciers made up for the decrease in erosion (after the junctions, the terraces dip and finally vanish). At the beginning or end of a glacial epoch, some glaciers were likely to flow into an unglaciated major valley holding a strong river. If the river could not melt the ice blocking its way, it was dammed up. The resulting lake flowed over the glacier where its surface was lowest: at the junction of the glacier with the opposite slope. The river eroded the rocks there (although its former bed was lower and farther towards the joining glacier), which created a new bed. Given certain circumstances (e.g. the glacier did not retreat until the new bed was deeper than the old one), the old bed was not used any more and remained as a dry valley or plateau. The Quaternary is characterized by periodic changes between cool and warm phases (glacials and interglacials). In the glaciers' foreland (periglacial areas), vast, scarcely vegetated tundras extended, where the bedrock suffered weathering badly from frost. Large amounts of resulting debris moved into streams and rivers so that they could merely carry it during flood events (this river type is called "braided river" - recent Alpine examples are the Tyrol's Lech and Tagliamento in Italy). At the end of a glacial, the river load was increased by debris left on the areas where glaciers had been before (glacial till). The rising rivers left the debris on large flat areas in the Alps' foreland. These plains are still visible today as terraces. During interglacials, the previous tundras where grown over with rich woods, which protected the bedrock from erosion. The rivers ran short of sediment load and started cutting into the terraces they had piled up before (straight river type first and meandering river type later). In case their erosional force was greater than the thickness of the terrace, the rivers even dug into the bedrock below. At the northern rim of the Alps, we find that not only the Alpine body has been lifting for all the Quaternary, but even the Alpine foreland. As a consequence, the rivers eroded more during the interglacials than the following glacial deposition could make up for. That's why the previous terraces can be found as shoulders on higher levels than the following (the principle of superposition - a deeper layer is always older than a higher layer - is not violated since the older terraces are situated beside the younger ones, not on top of them!). Due to the sequence of at least 5 glacials (Donau, Guenz, Mindel, Riss, Wuerm) and one interglacial each between them, series of terraces formed like staircases. Particularly nice examples can be studied in Vienna (Animation GIF 180KB). Note that the rivers (the Danube in this case) frequently removed previous terraces by lateral erosion, so that one or more terraces may be missing in some places. Apart from several intraalpine basins (Judenburg, Tamsweg, Wagrain, middle Enns valley, Leoben, Aflenz etc. ), there are some peculiar gravel deposits at high elevations in the Eastern Alps. For the shape of the gravel, they are called "Eye Stone Deposits". They prove that the area of the deposit used to be a river bed in former (possibly Miocene) times. The most prominent deposits are located at the S rim of the Northern Calcareous Alps: e.g. Miesboden / Kemet Mountains (N Groebming), Duerrnberg near Hieflau, Schneealpe, Raxalpe, Pollwisch Saddle (S St.Aegyd), Fegenberg (S Schwarzau/Geb.). In the Southern Alps, the deposit in the Fanes group - Col Becchei (NW of Cortina d'Ampezzo) is most interesting. During the Ice Age, many slopes became too steep (because of glacial erosion) and lost their stability, since there was no ice any more to rest upon. As a consequence, tremendous landslides occurred: The most serious landslide of Europe happened at Flims near the Rhine source, where 9 km³ of debris piles up several hundred metres where once a wide valley existed (that is 9 bn m³ or over 20 bn tons - in order to remove that, you would require a 2.5-million-km-long freight train, that's the length of the moon's orbit!!!). The debris dammed a huge lake, which cut its way through the dam, producing a deep gorge and emptying the lake (save the accumulated lake sediments at Ilanz). Since the slide happened in prehistoric times, there is no human evidence left. See also Univ. of Stuttgart. On the other hand, the landslide of Mount Dobratsch near Villach is well documented. Several villages were destroyed in 1348 and the Gail river was pushed about 1km to the S. What was left was the "Schuett" ("The Scree"). Among the rather unknown landslides in the E part of the Eastern Alps are the one in Alm Valley, Upper Austria, (a large part of the Hochplatten Peak, W Great Priel Peak, slid into Hetzau Valley, ran into Alm Valley and stopped at the S of Gruenau), and the one in Wildalpen at the N flank of the Hochschwab Massif (a huge peak between Ebenstein Peak and Brandstein Peak collapsed, the W part was blocked by Siebenbuerger Hill, whereas the E part ran far into the Salza Valley). 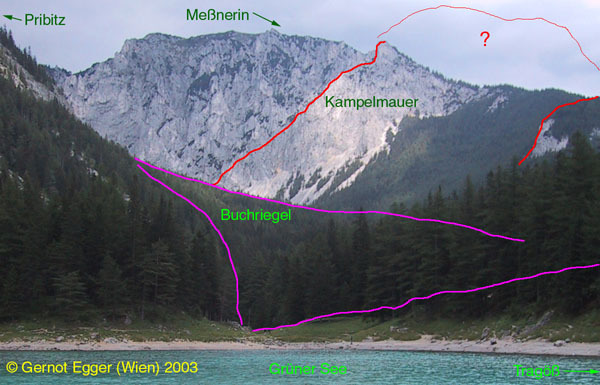 Two lesser landslide occurred at the southern flank of the Hochschwab massif: the southern part of the Messnerin Peak slid down and dammed the Gruener See ("Green Lake"), whereas the northeastern part of Trenchtling Peak blocked the Pfarrerlacke ("Parson's Puddle" - maybe this small lake served as the archetype for G.Newman's poem?) west of the Gruener See. The flank of the Hocharn Peak (Rauris Valley) may have slid down in prehistoric times. The remaining slope is now called Grieswies, whereas the rocks pile up at the opposite slope (the "Rauris Jungle"), whose surface is very coarse, therefore holding many small ponds - very spectacular on the one hand, very rich in mosquitoes on the other... Some hollows are permeable though, which causes e.g. the "Dry Creek" - nomen est omen - to vanish in the scree.). The force of the slide made the scree move up the opposite slope so that Grieswies (left-hand side) is now lower than the Rauris Jungle (the landslide mass is clearly visible at the right). I would estimate a landslide volume of 0.5 to 1 ckm. As at the Flims landslide, in Kolm-Saigurn, too, sediments accumulated, whereas the N slope of the Rauris Jungle is rather steep. View Figure and Animation. EXNER C.'s (1957) map identifies the area as landslide material, but he thinks that its origin is the eastern slope. Considering the landslide volume, this seems unprobable to me. Only a small landslide flowing out of Filzenkar (east) slid against the landslide. Recently, I found that A.v.POSCHINGER (1986) and J.HELLERSCHMIDT-ALBER (1998) did research on the landslide and also concluded that its origin is the Hocharn Peak. Any further suggestions are welcome! Minor landslides, which caused major damming nevertheless, are the ones of Lofer and N of St.Aegyd (Paulmauer Slide, HANTKE claims lake was 11km long?!). TOLLMANN gives an interesting but controversial explanation for a series of landslides around Imst in the Tyrol. There was one at Mount Tschirgant in the Inn valley, another at Fernpass, in Oetz Valley N and S of Tumpen and particularly at Koefels. Within the debris of Koefels (2 km³ ! ), through which the Oetz Valley River cut its way (the Maurach gorge), shocked quartz and feldspar minerals were found (R.SURENIAN, 1989), which are formed mainly during a meteorite or comet impact (pumice-like rock used to be interpreted as evidence for the meteorite, but it represents the bedrock molten by friction heat during the landslide - a similar case is Langtang Himal in Nepal, where it is called "frictionite", H.HEUBERGER, J.T.WEIDINGER, 1984, 1985). So an extraterrestial body has possibly caused the landslide. The impact might have shaken the surrounding mountains, triggering other landslides that would have once happened anyway. TOLLMANN dates the comet as 7550 B.C. and, referring to rich but controversial evidence, he claims that it was one small of seven large and some small fragments of a comet. The large ones struck the sea (not completely unrealistic, since the Earth is covered by 70% water), causing conditions similar to the ones caused by the Chicxulub impact which - if not caused then at least - contributed to the extinction of the Dinosaurs, Ammonites and many other species at the end of the Cretaceous. He describes heavy rainfalls, nitric dropout and a winter which lasted two or three years because of the dust in the atmosphere which shielded the Earth from sun radiation. These conditions extincted many life species, especially large mammal species (mammoth, sable-tooth tiger etc.) and also threatened mankind seriously, so that this event is popular in many - matching! - traditions of the whole world (The Deluge!!!!). Some scientists (e.g. PREISINGER) argue, that the evidence TOLLMANN refers to is not secure, in particular the dendrochronological, ice-core and radio-isotope data. Recent research shows that the landslides mentioned may not have happened at the same time. Nevertheless, TOLLMANN's book "Und die Sintflut gab es doch" (roughly: "The Deluge happened indeed") (Munich 1993) is very interesting to read. Due to climatic characteristics, large alluvial fans are particularly frequent at the S side of the Alps. 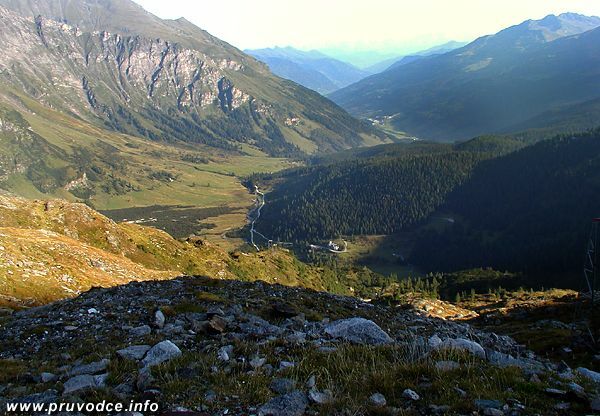 One of the largest probably is the one of Malser Haide in the Upper Vinschgau Valley (South Tyrol), which dammed the Haider Lake. Its volume may account for ckm, and measured from Mals to its source in Plawenn, it is over 800m (!) tall. Further downstream, there are several other a.f. in Vinschgau Valley, so that the Etsch river is pushed to and fro by opposite fans: Allitz / Laas / Kortsch / Schlanders, Morter, Tarsch / Latsch, Tabland and finally Partschins. In the Inn Valley, there is a sequence of several alluvial fans: Sautens / Oetz (just above the Tschirgant landslide), Stams, Mieming, Rietz (450m tall), Flaurling, Inzing, Zirl, Rum, Absam (11km²), Schwaz, Stans, Fuegen / Ziller, Muenster (450m), Kundl, Lahntal. In Antholz Valley at the border to East Tyrol, there is a 300-m-tall fan, which dammed up the Lower Antholz Lake. There are several remarkable alluvial fans in the Isel and Upper Drau Valleys (East Tyrol and Carinthia), starting at Virgen (300m tall), near Lienz (Thurn, 400m), several minor ones (e.g. Greifenburg), and finally in the Lower Drau Valley (Feistritz). Further downstream, in Rose Valley, many small streams flowing from the Karawanken Range are depositing large contiguous fans, extending as tall as 400m above the valley bottom (Little Duerrenbach above Suetschach). In the alpine reaches of the Rhine Valley, several alluvial fans can be found. The one below Chur is the greatest, extending more than 400m above the river. It consists of erosional debris from Fulberg Peak ("Decayed Mountain"). Further downstream, near Maienfeld, below Falknis Peak, a fan called Steigwald is 400m tall. In Rhône Valley, there are similar all. fans: Particularly large are the Pfyn Wood (near Leuk), the one of river Borgne (at Sion), the one of Chamoson and of Evionnaz below Les Dents du Midi. The identity of high slope with high elevation is frequent, but not essential. Some peaks rise only few hundreds of metres above a high valley floor (e.g. Grossglockner 3798m: 1400m, Fluchtkogel 3497m: 600m, Wysser Nollen (Winterberg - Uri Alps) 3398m: 700m), whereas some rise up from a low valley in an enormous single slope (Schneeberg 2076m: 1300m, Schafberg 1782m: 1300m, Raucheck / Werfen 2431m: 1900m, Brandjoch Peak / Innsbruck 2559m: 2000m, Zugspitze 2962m: 2000m)! Mont Blanc 4808m: 3800m (! ), Jungfrau 4158m: 3300m, Rocciamelone (near Susa) 3538m: 3100m, Mischabel 4545m: 3100m, Eiger 3970m: 3000m, Kirchbach Peak (Texel Group) 3078m: 2600m. The highest rock faces: Mt.Rosa east face: 2400m, Eiger north face: 1800m, Watzmann east face: 1700m, Rinderhorn south face (Kandersteg): 1500m, Birnhorn south face (Pinzgau): 1500m, Sorapis west face: 1500m, Mt.Agner north face: 1500m, Triglav north face: 1500m, Schermberg north face (Totes Gebirge): 1400m, Matterhorn south face: 1200m, Cimon-della-Pala west face: 1200m, Zugspitze north face: 1100m, Civetta west face: 1100m, Hochkoenig south face: 1000m, Langkofel east face: 1000m, Dachstein south face: 900m, Schrammacher west face (Tux Alps): 900m, Schneibstein north face (Hagen Mountains): 900m. These lists do not claim to be complete! If you look at a map of the Alps, you will soon find that the large lakes are not distributed evenly among the Alpine areas (as it would be convenient for tourism...). Quite the contrary: only few regions can benefit from their existence. This is because most Middle European lakes belong to as few as two types, which are - due to their nature - limited to few cases by topography: glacial lakes and reservoir lakes. Reservoir lakes are not that restricted as regards their location. Most of them serve for electric power generation (either reservoir power stations at high elevations, in cirques and the uppermost valleys, or river power plants) or for fishing or similar purposes (they are called ponds in the following list, and include quarry ponds, mainly in flat regions). Glacial lakes can be caused by several mechanisms (over-deepening at the glacier tongues, in caldrons or at narrows), but most of them are situated at the rim of the mountains or directly at main ridges (cirque lakes). Wiestal Res. SalzachHP none? none? Rotlech Res. InnHP none? none? Durnholz Res. none? ? none? L.del Mis none ? none? L.di V.di Lei none? ? none?